Artist Miguel Méndez will present his work during Holy Week and Easter, all of which was inspired by the beaches of Nayarit. The showing will be held at Bodega 3; this exhibit will kick off its new permanent dedication to expos. 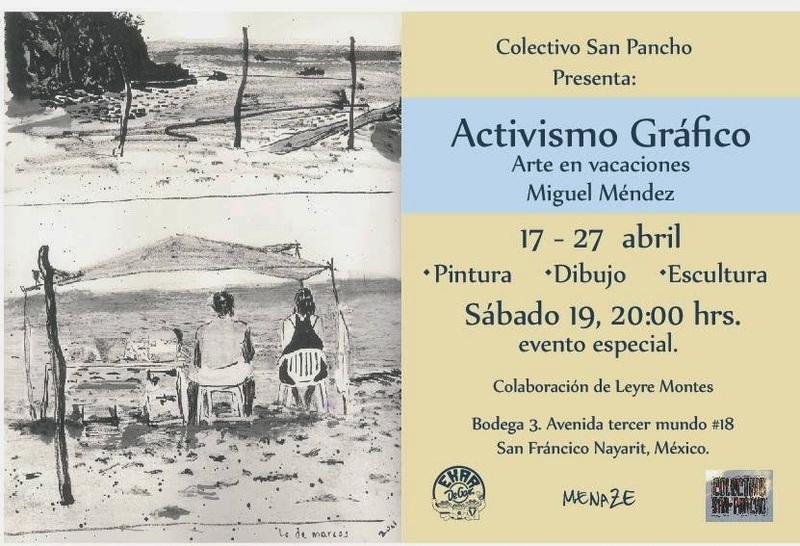 San Pancho, the Cultural Capital of the Riviera Nayarit, together with the San Pancho Collective, invites the general public to the expo titled “Graphic Activism, Art on Vacation” created by artist Miguel Méndez. The exhibit will be held from April 17-27 at Bodega 3, which will now begin to host artists’ showings. This exhibit, entirely inspired by the beaches of the Riviera Nayarit, is a turning point as it marks the first time an artist outside the Collective will use the dedicated cultural spaces in San Pancho. Méndez, originally from Guadalajara and with 30 years of experience as an artist, explained that his work is primarily for tourists, but he was inspired by the cultural ambiance of San Pancho and the towns that dot this coastal region. “Today, 30 years after my first visit to the Riviera Nayarit, I’m exhibiting the results of my Easter week vacations on Las Minitas beach in a series of drawings, paintings and engravings,” stated the artist in his manifesto. Luz Herrera, part of the San Pancho Collective, said the exhibit was a grand experiment that seeks to expand the number of artists they showcase, an inclusive initiative that will no doubt pay off for San Pancho. “This work is both an homage and an exercise in nostalgia for the landscape and the freedom of being able to enjoy sitting by the seashore accompanied by locals and vacationers to the Riviera Nayarit, to whom I am grateful for their company and their courtesy,” continued the artist in his manifesto. The special event takes place on Saturday, April 19, when only a few of the pieces will be for sale. Other dates set for exhibits at Bodega 3 are April 30th and May 28th. Because of the holidays and the expectation of more visitors than usual, San Pancho is also opening its Mercado del Sol at the Plaza del Sol on April 15th, 18th, 22nd and 25th.